“If I was rich, I will serve food to all without taking charging. Why do we charge for a one-time meal? Let them pay as they wish,” says Yasodamma who runs a small hotel at Thevally in Kollam. Like Yasodamma, She serves the best food in the town. But she never have a price list or demand an amount of money for the food served at her hotel. She has been running thi shotel as a great passion to cook and feed others. People can have as much food they want without thinking on price and GST added to the bill. They can pay the amount according to their wish. Yasodamma is the one and only owner and labour at the hotel. She starts her cooking from 5 o’clock in the morning. Without anyone’s help, she cooks meals for 50 people. She is not serving an ordinary lunch here. 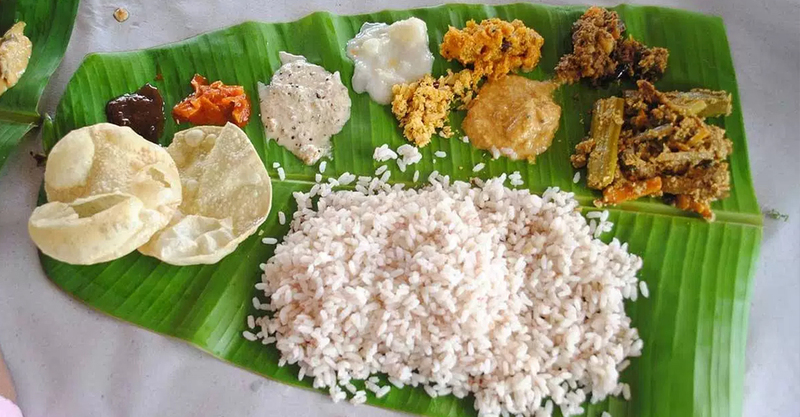 It is a mini feast with delicious fish curry, fish fry, boiled tapioca, pulissery, thoran, chamanthi, pickle and many more. It is surprising that this old woman will cook lunch for 50 people within 10’0 clock in the morning. A lady who sells fish to Yasodamma used to cut and clean fish for her. She is the only person who extend her hands to help Yasodhamma. Every day, lunch in this shop will be over within an hour. This small shop can accommodate at least 10 people at a time. She will arrange all the dishes in the shop and leave from there. Nobody will question the customers here. After filling their appetite, payment is also their choice. A small basket is the cash counter here. Customers can put the money in this basket. “I think satisfying one’s hunger is the most valuable noble action,” said Yasodamma. Yasodamma, a native of Karunagappally reached Thevally after her marriage. Her husband Chandrangathan passed away 12 years ago. Some students who reached for bank coaching classes near her residence requested Yasodamma to cook food for them. From then, she started to cook and serve. Later many people started to reach Yasodamma’s kitchen.Nowadays, huge rush of customers is seen in this hotel. Though she is having age-related physical problems, she never refuses to serve food for anyone. Yasodamma is an example of humanity for the hotel owners who prepare a costly bill for the customers. This shop is situated 2 kilometres away from Kollam railway station. One can reach the place by crossing Rama Varma Club at Anchalumoodu route.